The Bay of Bengal (BoB), which forms the northeastern basin of the Indian Ocean, is characterized by a unique environmental setting including a pronounced oxygen minimum zone (OMZ) with dissolved oxygen concentrations close to anoxic conditions and a heavily polluted atmosphere during spring. 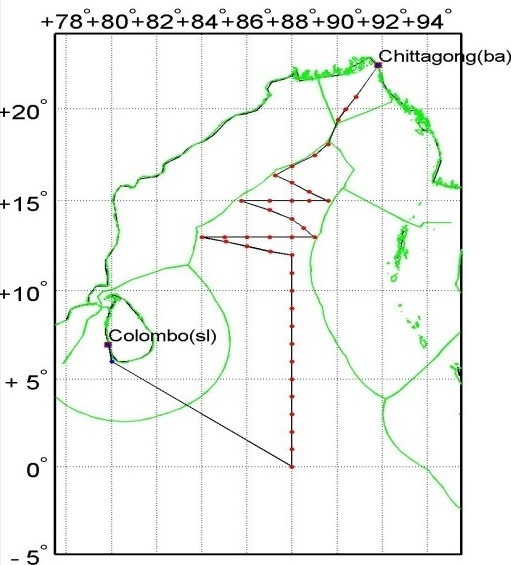 To this end, we propose a research cruise with R/V Sonne from Colombo (Sri Lanka) to Chittagong (Bangladesh) for spring 2019 in order to decipher the major natural and anthropogenic processes in the water column and the overlying atmosphere which affect the OMZ of the BoB. The project combines measurements of marine biogeochemistry, microbiology, physical oceanography and air chemistry with a foci on (i) the efficiency of the biological pump, (ii) the nitrogen cycle processes in the OMZ as well as (iii) the air/sea exchange fluxes of trace gases across the ocean/atmosphere interface and (iv) aerosol deposition. The findings will have global significance for our fundamental understanding of the future development and maintenance of OMZs especially in view of ongoing environmental changes such as ocean deoxygenation. The project will be a German contribution to the 2nd International Indian Ocean Expedition (IIOE-2) program.